To coincide with the bicentennial of Thoreau's birth in 2017, this thrilling, meticulous biography by naturalist and historian Kevin Dann fills a gap in our understanding of one modern history's most important spiritual visionaries by capturing the full arc of Thoreau's life as a mystic, spiritual seeker, and explorer in transcendental realms. This sweeping, epic biography of Henry David Thoreau sees Thoreau's world as the mystic himself saw it: filled with wonder and mystery; Native American myths and lore; wood sylphs, nature spirits, and fairies; battles between good and evil; and heroic struggles to live as a natural being in an increasingly synthetic world. 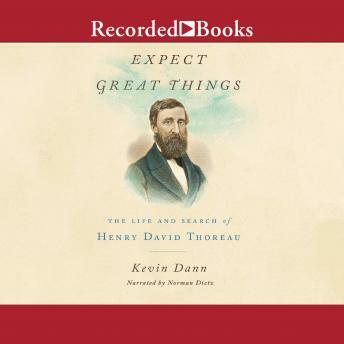 Above all, Expect Great Things critically and authoritatively captures Thoreau's simultaneously wild and intellectually keen sense of the mystical, mythical, and supernatural. Other historians have skipped past or undervalued these aspects of Thoreau's life. In this groundbreaking work, historian and naturalist Kevin Dann restores Thoreau's esoteric visions and explorations to their rightful place as keystones of the man himself.